Helen Morgan, the briefest of Miss Worlds, but where is she now? Helen Morgan became the most talked about Miss Wales when she resigned four days after winning the Miss World crown. A media frenzy erupted after it was revealed that Morgan, 22, had a son, which was against the rules. She handed back her crown after she was also cited in a divorce case - and disappeared into obscurity. Now the organisers hope she will come forward to help judge this year's Miss Wales competition in September. They believe she is now living in Spain and are willing to fly her to Swansea to take part. 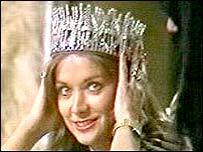 The former bank clerk was 22 when she picked up the Miss World title in November 1974 after being crowned Miss Wales and then Miss UK. But her joy was short lived, as was her guaranteed £10,000 income when it emerged that she had an 18-month-old son being looked after by her mother back home in Barry. Then a woman threatened to name her in a divorce action, which was later dropped, and she decided to step down. The runner-up, Miss South Africa, took the title instead. But she was allowed to retain her other titles, and a career in modelling, TV and films later followed before Morgan settled down in the 1980s in leafy Surrey, with a husband and two more children. Organisers of this year's Miss Wales now want Morgan to help judge this year's competition, which they say has attracted a cosmetic surgery business as a new sponsor. There will also be automatic entry for the winner into this year's Miss World in China in December. Supporters say the beauty contest business has modernised since the days of the swimsuit line-up and contestants' assurances that they wanted to work with children or for world peace. "Bikinis went out last year - we were the first in the UK to get rid of them," said Paula Abbandonato, licence holder for the 2004 Miss Wales. "Of course, the rules about unmarried mothers - or any mothers - not being able to take part have not changed." "But Helen Morgan is still the most talked about Miss Wales ever and we would like her to be at this year's event". They are printing an open letter to the former beauty queen in a weekly free newspaper distributed in Barry, where she lived with her former boyfriend 30 years ago. "We've been told she is living in Spain now but we're not sure. We really hope she will get in contact and want to be involved," said Ms Abbandonato. "Beauty pageants are resurgent. People are fascinated by them". Is Miss Wales still a hit?